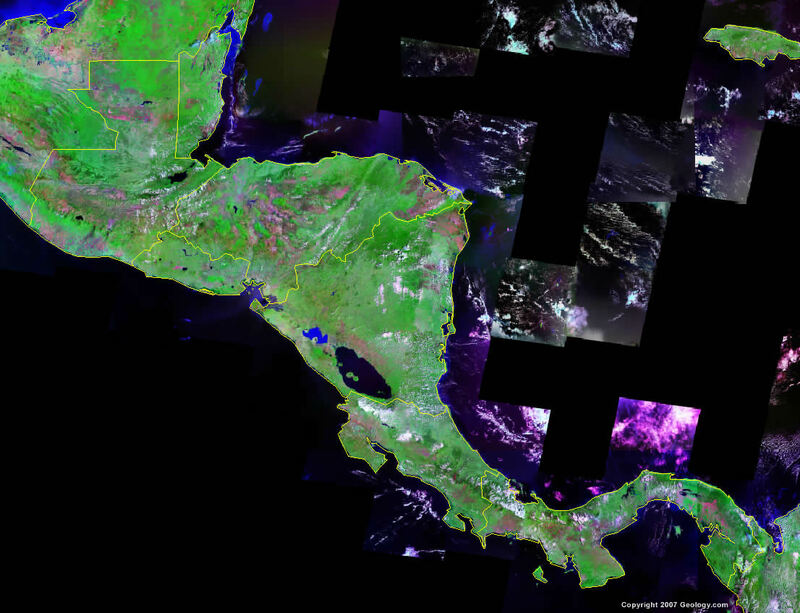 Central America is an isthmus that connects North and South America, extending from Mexico to Columbia. The Caribbean Sea is on the east coast and the Pacific Ocean is on the west coast. Belmopan, Belize City, Orange Walk, Puerto Barrios, Coban, Quetzaltenango, Guatemala City, Escuintlia, Santa Ana, San Salvador, Santa Rosa de Copan, San Pedro Sula, La Ceiba, Juticalpa, Tegucigalpa, San Miguel, Chinandega, Leon, Managua, Masaya, Puerto Cabezas, Bluefields, Liberia, Puntarenas, San Jose, Puerto Limon, David, Santiago, Chitre, Colon, Panama City, Nargana. Central America has large amounts of metal and industrial mineral resources. See individual country reports for more detail. Central America has a wide range of natural hazards. Please consult the individual countries for more detail. Central America has a wide range of environmental issues. Please consult the environmental issues list for specific countries.